the 15inch sub would be placed at rear left. I was in similar position , dual kk808 with rythmik fv15hp. They do work to provide rumble, but i do think they are not the perfect match. Cone diff 8" vs 15", speed diff are obvious. Having said that, the new kk is improved to provide more rumble. You may want to drop in earth sound for audition. They should be launching soon with early bird discount. REW your room.... calibration, tweaking and listen with your ears. Good advice from Ralfale, the pairing won’t work. Your 8” subs will bring down the whole system and your 15” subs Performance will be capped due to insufficient headroom from the 8” sub. If you like the signature of the kk then the new kk 1000 seems to be a better choice pairing with a 15”, try and go for all seal subs if possible. Bryan touched on an important point on headroom. Indeed they are pretty big gap based on cone size efficiency. That was the main reason i had to sell off my kk808 and moved to something bigger in my new hall. Depending on how loud you crank your sub, you might be able to make do with current 808 (highly recommended to go for min 12" though). If you have to add rumble , perhaps replacing the 808 will be your best bet for better integration and ease of setup. Fyi my new hall is about the size of your room, and 808 ran out of headroom quickly on my listening volume. One way to maximise is to place the smaller kk808 nearfield, eg behind the MLP sofa etc. 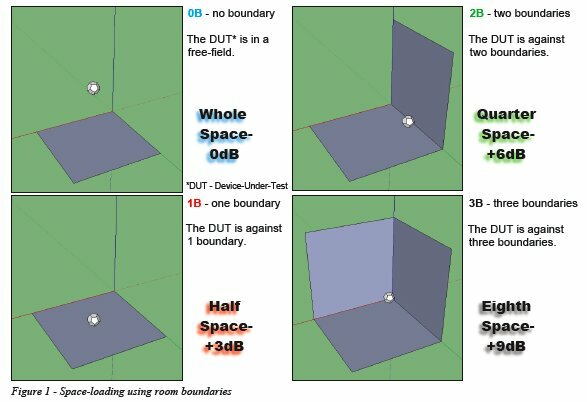 In small spaces, sound drops about 3db per doubling distance. So having them at 1m behind sofa instead of 4m across the room, gains you about 6db+. Corner loading them also works. A trihedral corner (eighth space) provides up to 9db in low bass, while a dihedral corner (quarter space) up to 6db. 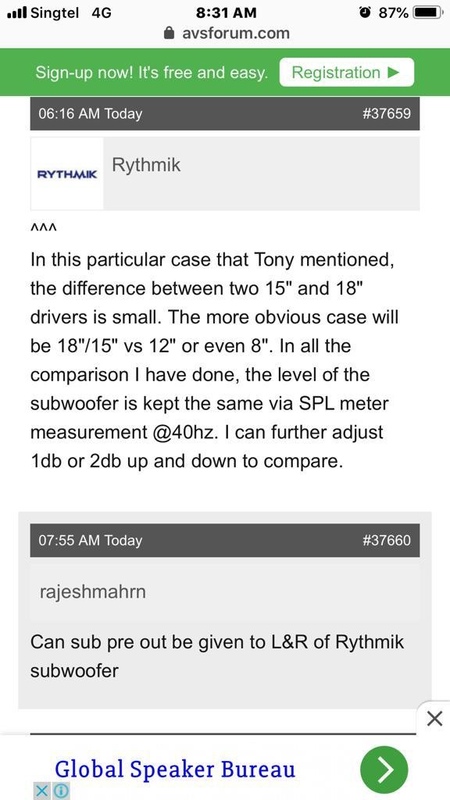 10db is 10x power, 6db is 4x power. 6db advantage makes a 300w amp feel like 1.2kw amp. Well not exactly, but it's as close to a free lunch as anything - I'll have it! If your room is symmetrical, placing one at each back corner, or both stacked at one corner. Though this might feel slightly unbalanced, you feel the midbass coming from one side at the back. If there are no back corners, then just the wall- floor corner directly behind the sofa. You get the boundary gain, as well as the nearfield effect, so it has a better chance of keeping up with a big FV15HP at the front corner. Like ralf says, depending on listening volumes and expectations (which varies wildly) , it may be enough for your needs. There's a e15hp selling at 1.4k, or a pair of orison dd12+ asking 1.6k. 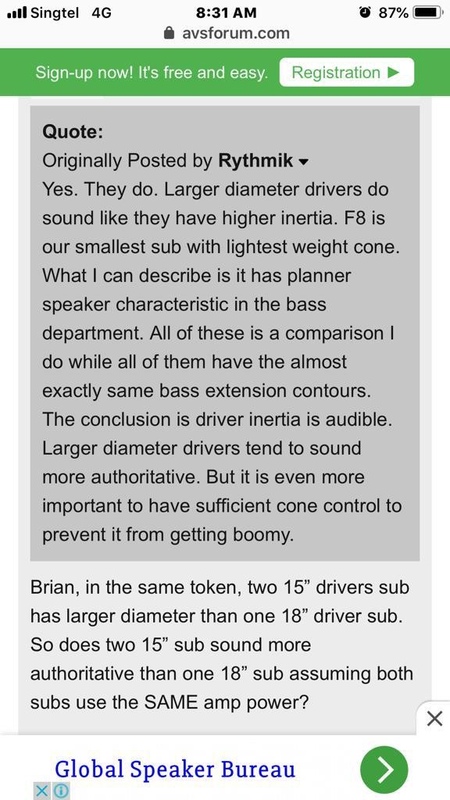 Both are considered low bass subs, but perhaps you might want a ported 15 for the size of your space. All things equal, say a Rythmik F15 vs a FV15HP, the ported will have about 6db more output around the tuning frequency. Requirements go up exponentially for low bass in large space, ported helps to meet that. Again that depends on your expectations too. Great advice by ronil, wech, ralfale as usual again. Your 8” subs will bring down the whole system and your 15” subs Performance will be capped due to insufficient headroom from the 8” sub. Well, if u LOVE the sound signature of the previous KK model & just want some low rumble and not listen very loud, instead of adding a 15", why not consider swapping for a dual KK12012 setup (like what whitesox suggested too)? This could be a more hassle free & simple solution! Cos much simpler to integrate identical subs. I was on a dual kk12012 setup previously, after the dual kk808 + 15". I liked the overall sound of the dual kk12012. There is some low rumble compared to the 808, and yet retain the awesome detailed moving midbass. But, the other pivotal factor/ question is - how much low rumble u prefer (aka how "spicy") & how loud are your listening levels? Because if you prefer VERY STRONG low rumble, dual 12012 may not be suitable for u. For my taste, I needed much more low rumble which the dual 12012 could not give me at my usual listening levels, so i swapped to another sub. I think there was someone selling a dual 12012 in the used forum, listed here for ur convenience (http://www.xtremeplace.com/yabbse/index.php?topic=282952.0). Maybe useful to snag it, test for yourself if the rumble is "spicy" enuf for u. If spicy enuf, all is good! Just for info , we have added a new feature on the New DXD1000 , which allow the 60Hz roll off to be lifted and on Top of that double the power to 1200W , so not only allow the sub to go lower but also increase the useful SPL for another 6-8db depend on the setting and location. 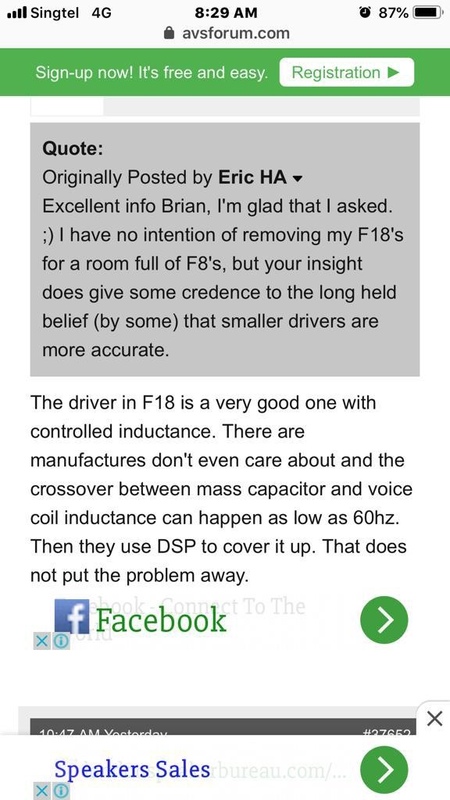 Ok here it is, you can hear it from the horse mouth, Brian ding from rythmik on why the pairing of the 15” vs 12 or even 8” won’t work and also confirms that why 18” Drivers have better inertia and will sound more authoritative, and it is audible. key to this is also controlling the boominess vide it’s servo feedback. Why I’ve never looked back after having the 18” seatons, x4! Still I believe good neighborliness is very very very important. We need to be considerate when we play movies at loud volumes during evening times. The moment you get into a quarrel with your neighbors...that's it! You can expect endless nuts coming at you for as long as you lived there.